New Platinum Card® Cardmembers, earn 50,000 Bonus Membership Rewards® points by spending $3,000 in purchases in the first three months of Cardmembership. Platinum members earn 1.25 Membership Rewards® points for every dollar in purchases charged to the Card and automatically enrolled in the Membership Rewards First™ Tier. 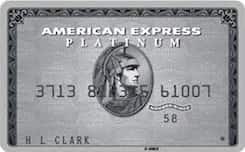 You will have access to a $200 CAD Annual Travel Credit to use towards any single travel booking of $200 or more charged to your Platinum Card and made on www.americanexpress.ca/travel or through Platinum Card® Travel Service. Relax in over 1,100 airport lounges worldwide. Enjoy access to the following partner lounges and benefits: Canadian Platinum Lounge Benefit, Delta Sky Club, The Centurion Lounge network, and Priority PassTM membership. You will also have access to many leading hotel and car rental companies’ loyalty programs. Our partners include Starwood® Hotels & Resorts, Hilton Hotels and Resorts, Radisson Hotel Group, Hertz and Avis. Platinum Cardmembers can enjoy access to special events and unique opportunities and a dedicated Concierge team. This CAD currency 9 is issued by American Express and runs on the American Express Network. The purchase interest rate for this credit card is: 30 percent annually and the transfer balance interest rate is: % per year. Also the cash advance rate is: 3% per year. Travel cancelation is Included for this credit card and also travel accidents are Included.